Each month I showcase a small selection of books that I've loved reading. Some of them might be best sellers, but the majority of them won't be. That said, I didn't do a book finds in February because I had too many other things to share! But, I'm back on track now. So, what treats do I have to share with you this month? "Imagine you're the only boy in a town of men. And you can hear everything they think. And they can hear everything you think. Imagine you don't fit in with their plans... Todd Hewitt is just one month away from the birthday that will make him a man. But his town has been keeping secrets from him. Secrets that are going to force him to run... "
In Prentisstown, there are only men. Everyone can hear everything you're thinking - even your dog. But where are the women? What happened to them? Why are the townsmen telling Todd lies? Who, or what, are the Spackles? 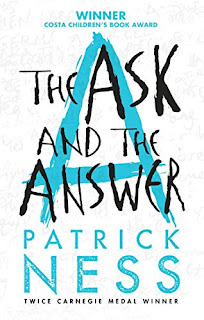 Please don't think that because this is classed as Young Adult fiction, you might be 'too old' for it. You won't be. At the heart of the trilogy is a story about people. 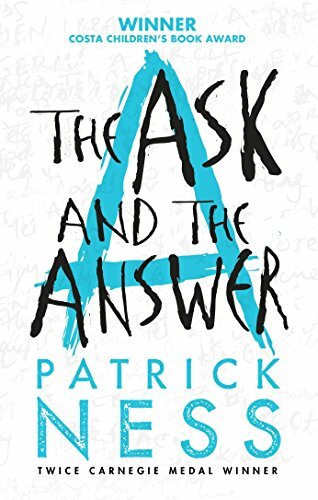 About how civil wars start, about how good and bad can exist in the same person, about how it would feel to know everyone's darkest secrets and be unable to have any of your own. "We were in the square, in the square where I'd run, holding her, carrying her, telling her to stay alive, stay alive till we got safe, till we got to Haven so I could save her –"
The book follows on immediately after the end of the first in the trilogy. Todd and Viola end up on opposing sides of a civil war. Often the story is told from the different sides in alternate chapters and the way the same events are spun and interpreted by the other side is very cleverly done. 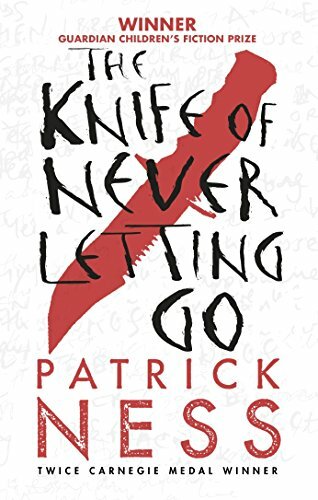 A lot of very significant themes are explored, such as torture, terrorism, the treatment of indigenous peoples, but in a way that is suitable for readers aged about 15+ (or adults, like me!). “War,” says the Mayor. “At last.” Three armies march on New Prentisstown, each one intent on destroying the others. Todd and Viola are caught in the middle, with no chance of escape. As the battles commence, how can they hope to stop the fighting? How can there ever be peace when they’re so hopelessly outnumbered? And if war makes monsters of men, what terrible choices await? 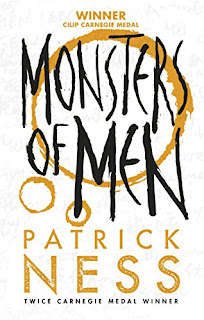 But then a third voice breaks into the battle, one bent on revenge…The electrifying finale to the award-winning Chaos Walking trilogy, Monsters of Men is a heart-stopping novel about power, survival and the devastating realities of war. When I got to about halfway through this book, I was torn. On one hand, I wanted to read it as greedily as I had the first two books and devour this third book in a gulp. On the other hand, I didn't want the stories to end. I wanted there to be resolution for all of the main characters but I also wanted to read about them for longer; to stay in their world. To me, that's a sign that the author has done his or her job perfectly. I just loved this set of books. I think they are suitable for anyone above the age of about 15. Younger than that... there are some tough themes and quite a lot of violence. Maybe if you're thinking about them for someone around that age, you should have a read of them first and see what you think (much as you would check out a film that indicated a particular age range and you wondered if the person you had in mind would cope). 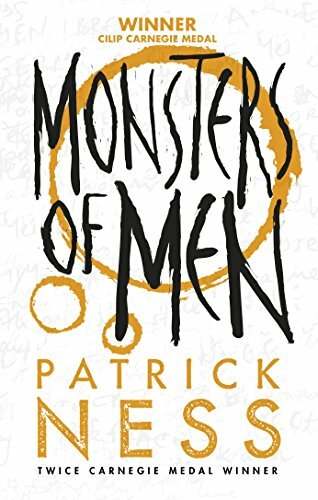 The writing is terrific, the characters leapt off the page, the plot is well thought out, intricate and had a number of twists and turns, and I was left thinking about the books for a long time afterwards. If you've already read them, what did you think of them?